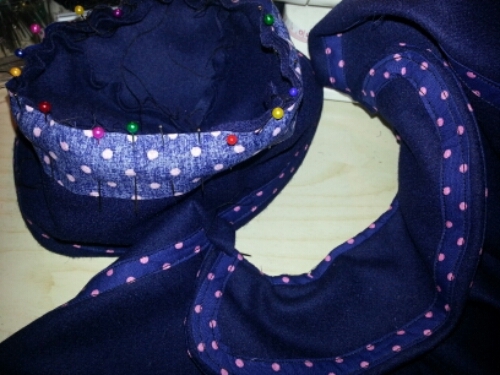 The collar now has a slightly wonky trim, a lining and is now ready to be attached to the coat. As this is a vogue pattern it is rather complicated but I know from previous Linda Carrr vogue patterns that they result in a much more beautifully finished item than an easier pattern. 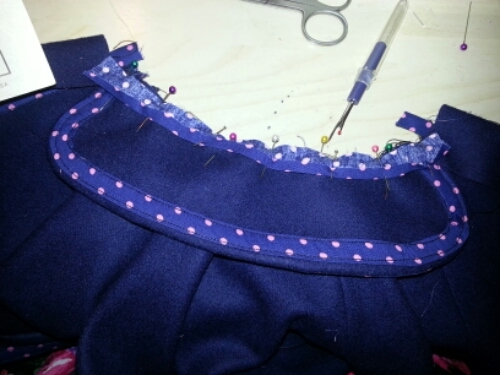 When I brave sewing lots of clothes for myself, the skills learned from these patterns will be useful. This is the attached collar. As you can see the hat is now pinned ready for the trim which covers the join between the brim and crown. What you can’t see is that I have a nice little burn on my finger from the iron because I always do that when sewing. Knitting is calming as you just sit and knit. Sewing is exhausting – every time you do a little bit you have to go and iron it. Time to sleep now before I make any silly mistakes. Live sewing will resume in the morning.